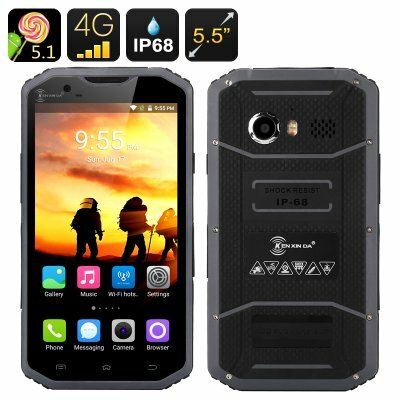 Successfully Added HK Warehouse KEN XIN DA PROOFINGS W8 Rugged Smartphone - 5.5 Inch, Android 5.1, IP68, Octa Core CPU, 2GB RAM, 4G Dual SIM (Grey) to your Shopping Cart. When the going gets tough it is time to relight opn a rugged Smartphone and the Ken Xin Da Proofings W8 is exactly that. With its IP68 rating the Proofings W8 Smartphone is as tough as they come. This rugged phone is waterproof dust proof and shock proof so can withstand punishment that would destroy any normal Smartphone. If you're the outdoors adventure type then you can enjoy all manner of extreme activates without having to leave your phone behind, that's because this Ken Xin Da Rugged Smartphone has been made to survive the toughest of conditions and keep on working. Submerge it in water, burry in dirt or drop it on the concrete ground without fear of this phone breaking, now you can have a phone that able to live life at your pace. A large 5.5 inch HD screen makes viewing easy so you can pass the time on long journeys watching movies or surf the web with ease. This is made easier with the phones 4G connectivity that allows you to utilized ultra fast cellular data connections that are on par with most broadband speeds. You can even seamlessly stream HD video content direct to your phone. Powering this rugged Smartphone to a spectacular performance is an octa core CPU and 2GB of RAM as well as a Mali GPU so it can easily handle all your multitasking needs as well as run the latest games effortlessly. An Android 5.1 operating system ensures a smooth user interface and gets the best performance from this cell phone. There are a slew of additional features such as smart wake and gesture sensing making it faster than ever to navigate to your favorite apps while enjoying an intuitive responsive performance. The front and rear cameras can snap 5MP and 8MP photos respectively, and with a n LED light the Ken Xin Da W8 can snap high quality shots even at night. Bring hours of usage and days worth of standby is a 3000mAh battery so your phone will keep going as long as you can. The Ken Xin Da Proofings W8 Rugged Smartphone comes with a 12 months warranty, brought to you by the leader in electronic devices as well as wholesale Android Smartphones.